It is rightly said that the eyes are windows to the soul. The first facial feature that catches our attention is the eyes. Beautifully done up eyes speak a thousand words, and at the same time, patchy coloured eyes spell absolute disaster. 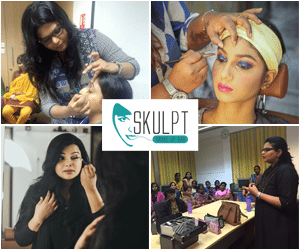 No wonder why every makeup artist course in Chennai focuses mainly on the eyes when it comes to facial makeup. Learning the trick of perfect eye makeup is an art. Though not difficult, it does take a little time to master. Before you proceed onto work on your eyes, be sure of two most important aspects; number one is the colour of your eyes, and two is your skin tone. Different shades complement different eye colours and skin tones. For example, browns and peaches go with warmer skin tones. And if your skin colour is light, you can experiment with more vibrant colours. The colourful eyes – that uses a palate of colours across the lid to create a bold look. 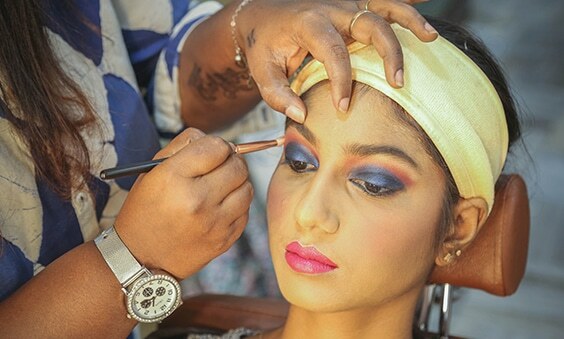 Not everybody can afford a professional makeup artist to do the eyes for them always, and therefore, it is important to learn few dos and don’ts. It is important that your eye shadow and liner keeps smudge free for hours. For the purpose, try buying the smudge proof colours for your eyes and apply a thin coat of foundation over your eyelids to keep the shadow colours and liner intact. One trick that always helps to create dramatic eyes consists of applying the lightest tone of all over the lid area, applying the medium colour tone over the inner crease, finishing off with the darkest tone over the outer crease. Before you proceed with your eye makeup, get the right kind of tools and cosmetics. If you are using cream base shadow, ensure that you put only a thin film of it over the eyes. Powder eyeshadows work fine and are particularly easy to use when you are required to blend two or more colours. The colour of your eye makeup makes all the difference. More often than not, we are confused over this one aspect. Other than the colour of your eyes and skin, you should also take into the account whether it’s a day or night makeup and whether the place will be highly illuminated. For those interested in learning about eye makeup in Chennai, several advanced makeup classes are available that can help in the process.